It is summer and there are lots of things to do, so I haven’t been embroidering. I’m slower than ever. Ha, ha! But there is a little progress on Block 15 of Aunt Bea’s Parlor. 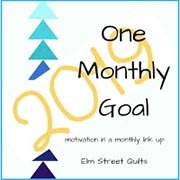 I am linking up with Kathy’s Quilts Slow Sunday Stitching. Head on over there, and get inspired! I am staying focused on my Slow Sunday Stitching project. I finished Block 14 of Aunt Bea’s Parlor. Slow and steady; I’m getting there. I will be linking up with Kathy’s Quilts Slow Sunday Stitching.